As the most popular fund family, Vanguard also offers variety of actively managed mutual fund. 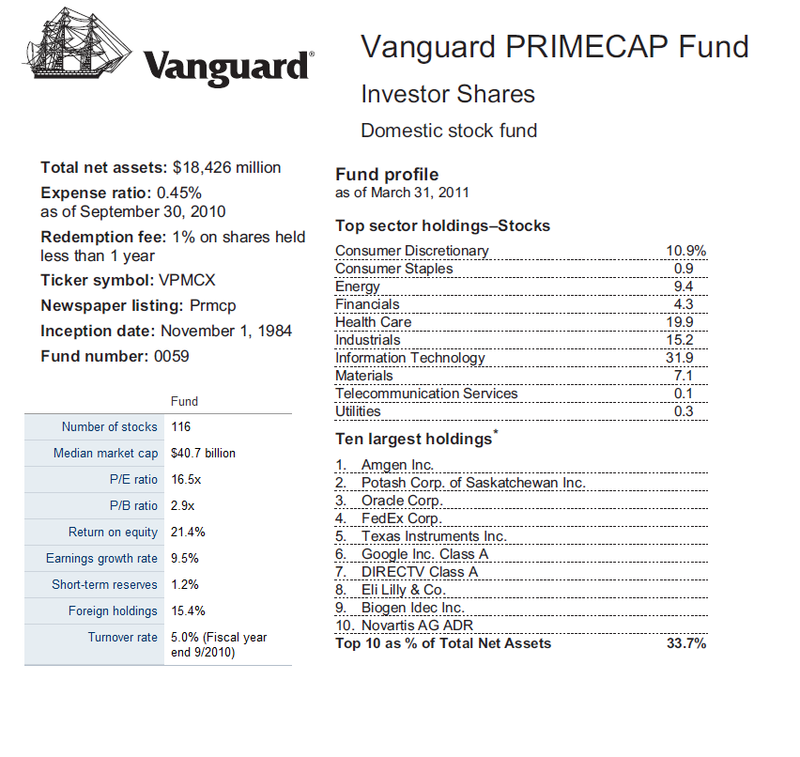 One of the best US domestic stock funds is Vanguard PRIMECAP fund. This fund has a very good long track record. Details about the fund's review is below. 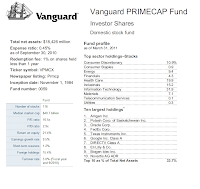 The Vanguard PRIMECAP fund objective is to seek long-term appreciation of capital. This Vanguard fund invests in stocks considered to have above-average earnings growth potential that is not reflected in their current market prices. Its portfolio consists predominantly of mid- and large-capitalization stocks. This fund has been managed by Howard B. Schow since the inception in November 1984. The last dividend was distributed in December 2009 and capital gain distributed in 2008. This fund has 0.86% dividend yield. This fund is only available to be purchased for the brokerage account with the minimum investment of $3,000. As part of no load fund, there is no management fee and no sales load fee. The annual holdings turnover as of October 2010 is 5.00%, quite low compared to the average in the Large Growth category which is 87.49%. This Vanguard fund has total net assets of $18.3 billion. VPMCX has 0.45% annual expense ratio rate which is quite low compared to the category average (1.31%). The best performance of this fund was in 1999 with 41.34% within its 21 years of positive return record. While the worst was in 2008 with -32.41% return within its 5 years of negative return. And it has returned 28.41% over the past one year, and 5.40% over the past decade. The fund has 4-stars rating from Morningstar. It has 8.09% of year-to-date return. There are 53 brokerages that provide the purchase for this top rated fund, include Vanguard, JP Morgan, Royal Alliance, Schwab RPS All, Scottrade TF, Firstrade, Mony Securities Corp, LPL SAM Eligible, etc. The benchmark of this fund is S&P 500 Index. The other class of this fund is Primecap Fund Admiral (Ticker: VPMAX) with the minimum initial investment of $100,000. As of April 2011, the top 10 sectors of this fund are Information Technology (31.9%), Health Care (19.9%), Industrials (15.2%), Consumer Discretionary (10.9%), Energy (9.4%), Materials (7.1%), Financials (4.3%), Consumer Staples (0.9%), Utilities (0.3%) and Telecommunication Services (0.1%). Ant the 10 largest holdings that represent 33.7% of total net assets are Amgen Inc, Potash Corp of Saskatchewan Inc, Oracle Corp, FedEx Corp, Texas Instruments Inc, Google Inc Class A, Directv Class A, Eli Lily & Co, Biogen Idec Inc and Novartis AG ADR.